The idea is to make two-cylinder engine came to us with the son, that is, from want. In times of General scarcity in the economy was necessary for some vehicles to have the house and farmstead to provide those without something to exist person in the Russian hinterland is simply impossible. This is the wood, hay, building materials, which had to bring. Plowing and treatment of the infield in the required quantities without the technology, too, was unbearable. Like most homebrew, I designed that there was or that it was possible to get without any cost, i.e., to exchange, to provide for the desired unit service to perform some work, just pick up thrown away. And were available motorcycle veteran “IZH-56”. We understand that if the “harness” its power unit in a self-propelled mechanism, the engine output is hardly enough for heavy agricultural or transport operations, even if the motor force. That’s when I got the idea to try to combine two suitable motor in one as it made the motorcycle “IZH-Jupiter”? 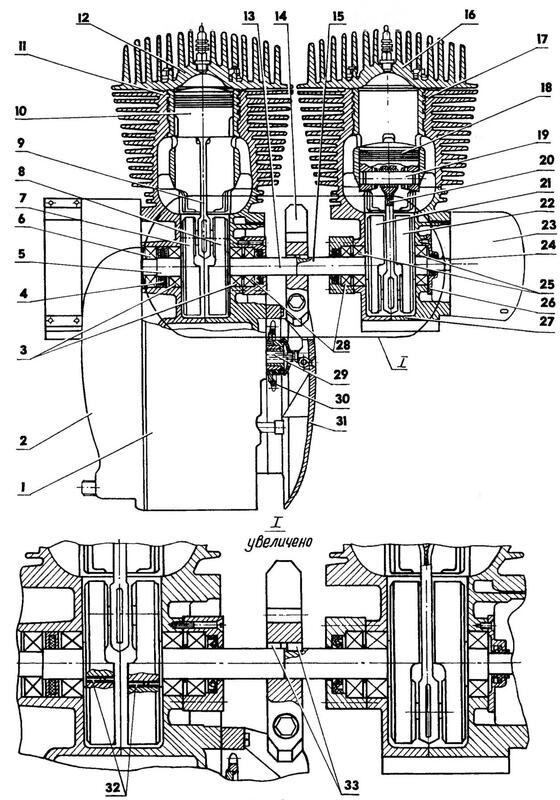 Estimations by analogy with peterhofsky engine even without calculations showed that the power of the coupled motor should be increased and a half times or more, compared with the single cylinder. And this is something. Then it (power) should be enough for all-terrain machine that can be used as a tractor or even tractors. Find old Izhevsk workable motor was no effort. While disabled war and labour has moved from sidecars, actually is not esdev, “the Cossacks”. The engine from С3Д its characteristics more than others, came to surviving my motor from “IZH-56” to create a coupled power plant. Besides motorolacom the engine had a air cooling system. Since all-terrain vehicle-tractor supposed to be used on small and even very low speeds, such air cooling of the cylinders was a must. In the housing of the crankcase stroller was missing the generator section, any motor crankcase But to design two-cylinder powerplant that was a plus even section it would have been unnecessary and it would still have to dismantle. Although the manufacturing of two-cylinder installation, in General, were few, but embodied this idea in the design is not so fast, because I have done it from time to time. Started to assemble the system together with his son, but soon he was drafted into the army, and ran in again together, when he had already served. For the dual motor is useful mainly items factory made by the same type of engines with their corresponding alteration if necessary. The factory connecting rods and crank shafts to support this load without their strengthening and modernization has not a chance, especially because I had a bitter experience when almost new bike with very careful operation failed crankshaft. I took the connecting rods of the old model. Their difference from today is that they are at the bottom of the head has a middle slit that provides a better lubrication of the bearing. Regular bearing in this node is also upgraded. 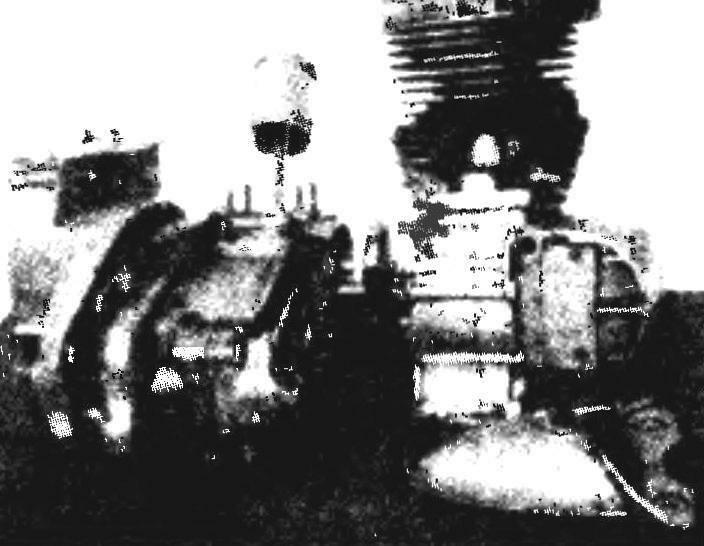 In the factory version in the lower end of connecting rod has a double-row roller bearing the Rollers rotate in the separator, and one pair to the other is approximately the same distance as the diameter of the rollers themselves. And there is no need of any laboratory studies to see what the load experienced soprikasalis details of the lower head at the time of the outbreak of the combustible mixture: the upper pair of rollers as a blunt chisel, “cut” and the neck and head of a rod, experiencing the overload, because the front and rear running rollers they hardly help. I decided to replace the paired rollers long with a diameter of 4 mm (from “Sunny” transmission tractor DT-74) and installed them without a cage, close to each other. Connecting rod journals turned a new and subjected them to grouting and polishing. On choosing the right solutions says eleven-year trouble-free operation of this site. The most complicated operation on the machine fell from a motorcycle “IZH-56” (paired power plant it is the right unit). From Carter I separated camera gearbox and clutch with all its contents, leaving only the crank and generator section. The power unit from the motorized wheelchairs used almost completely, only separated from the right crankcase cover her front part. 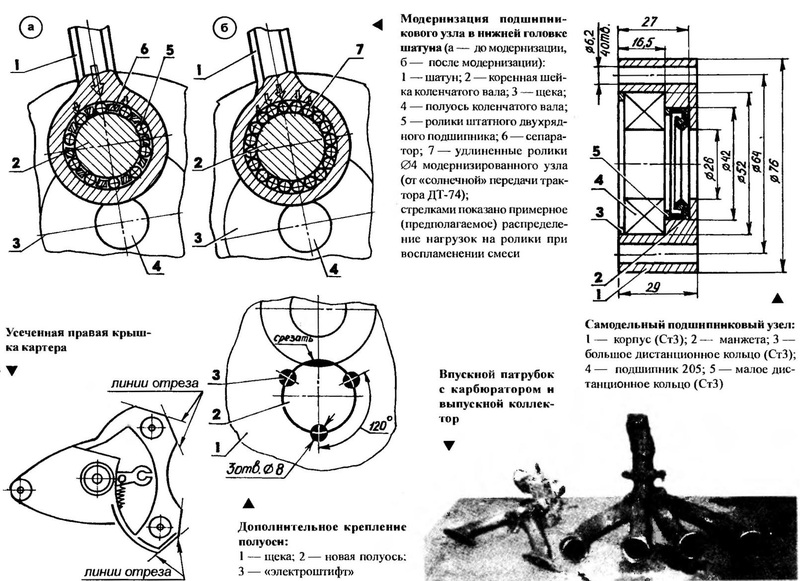 Piston group, cylinder (blocks and heads) left unchanged, but the axle crankshaft (right — motocoaster engine and left — Izhevsk) as well as radical neck lower heads of the connecting rod, machined other with an allowance of 2 mm diameter for final processing and polishing. Two shafts are identical, only carriage motor drive shaft is 17 mm long. I also tried to use and installed onto the axle shaft with additional bearing 205 in makeshift housing, attaching the latter to the place of the regular cover screws M6, pre-cut holes in the crankcase the appropriate thread (the regular cover has pricecialis screws M5). Same bearing with a sleeve in the same homemade package installed and another new driveshaft instead of the standard bearing 304, which stood on the same axle. Incidentally, I note that the ribs of the semi-axes is 0.5 mm wider than the grooves in the holes of the cheeks (the bearings are free from the cheek), and the location of keyways in the semi-axes correspond to the top dead centre (TDC) on the left (the wheelchair) the cylinder and BDC is on the right (motorcycle). Themselves pins, and the flywheel from a motorcycle “IZH-Jupiter”. The length of the rod is assigned the minimum possible to create the most compact motor. In the factory version from the crankshaft axis and the crankshaft journals for the lower heads of the connecting rod are assembled with their holes in the cheeks. I do these joints with new reinforced drive axles still in the following way. Inserting into the hole in the cheeks of the axle shaft and oriented with its keyway in a dead point, carefully put mutually perpendicular coils the positions of the parts. Then the circumference of pairing them approximately equidistant from each other drilled three deaf nests, thus obtaining a pair of semi-cylindrical notches simultaneously in both parts. In socket put the segments of the electrodes and brewed their there torch. Cooked so that the sockets melt gurgled and bubbled. After cooling, get a kind of pins, eliminating the turning of the axle in the cheek. Nodules cleared on the sandpaper, at the same time cut in the hollow cheeks, the protrusion of the axle shaft. Then finally sharpened and polished shafts. Another upgraded item two-cylinder power — plant- sprocket shaft. Its alteration is associated with the replacement of the drive chain on enhanced and wider chain with a pitch of 19 mm (agricultural machinery), since the engine is intended to use in a jeep-truck. The alteration consisted in the fact that with the standard sprocket, removed the teeth and rim and sprocket with a pitch of 19 mm cut out the hub and disc so that the outer diameter of the first corresponded to the inner diameter of the second. Wearing then one detail to another with displacement of 3 mm, welded both parts in a circle, with the outer side of the solid seam and the inside— intermittent. Since the front part of the right crankcase cover interfere with the installation of the flywheel, it had to be removed, and the flywheel with the axle cover to cover. 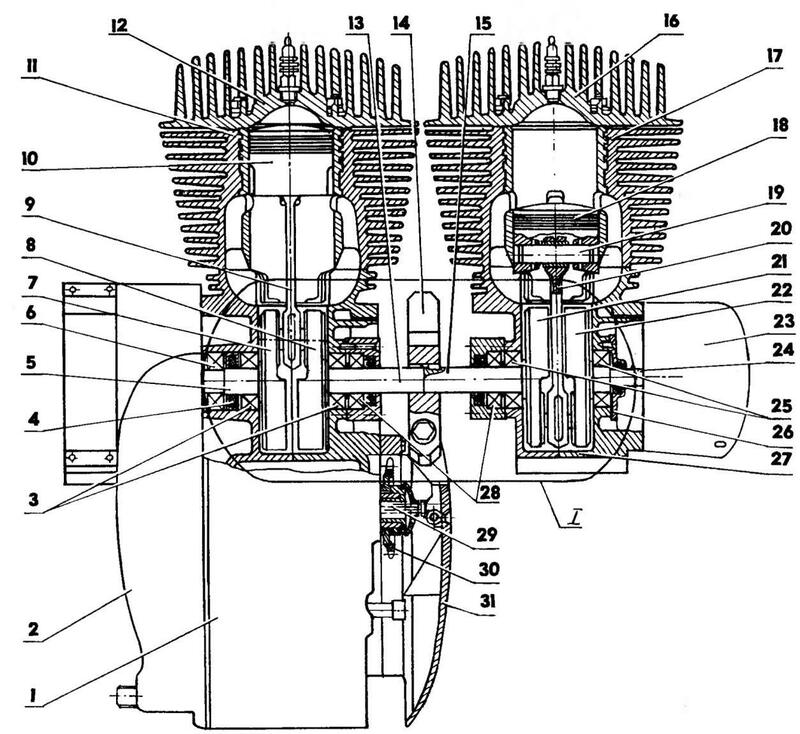 The casing of forced cooling of the engine has covered only one cylinder. To the air stream and came to another, had to make an additional cover made of 0.8 mm steel sheet. When assembling the two-cylinder powerplant two shafts together by means of a single flywheel to the crankshaft. Further Assembly motocoaster and motorcycle units in a single engine produced in the following way. With both cylinders removed heads and cylinders combined 7-mm steel plate with drilled in her holes for the studs. Then, for paired installation, welded in place under engine frame with necessary lugs, brackets, cradles. In the final mounting of the power plant to the underframe constantly replayed the kick starter crankshaft, identifying and eliminating linings and washers slightest runout. Oddly enough, it turned out to be not so difficult. The result is a two-cylinder setup is quite compact, the units are tough, and the crankshaft rotated easily and without pulsation. Additional rigidity gives the setting common to both cylinders dual intake pipe and exhaust manifold. Pipe made of steel pipe with diameter of 36 mm with a wall thickness of 1.5 mm from the oil line of the motor grader, picked up at the dump. It is well matched for diameter and the inside was very smooth, and the metal is quite soft and malleable. Heating the pipe with a blowtorch, bent her as far as was possible, but she didn’t. Cutting the pipe size between the inlet Windows of the cylinder, the ends are slightly relaxed and tapered, making them a rectangular cross section of the hole 45×32 mm in the flanges. Flanges welded to the ends. In the middle of the convex part of the nozzle is embedded a small part of the same pipe, and to its end is welded a flange for mounting the carb. 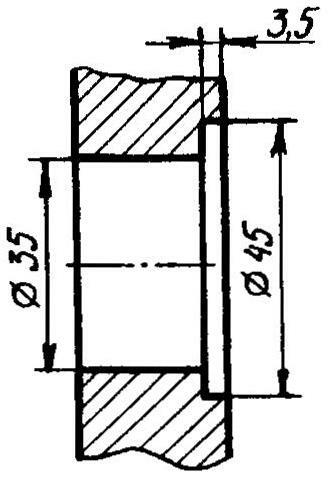 Flanges manufactured in accordance with the prints on a piece of drawing paper. Subsequently, from the concavity welded to the inlet eyelet, which cling to the spring mounting of the fan housing. How did the exhaust manifold, I will not tell. Notice: this work is not for the faint of heart. Many-many times removed-was screwing a cap nut, has not yet customized all the tube, each to its discharge hole in the cylinder. And cooked it almost all directly on the engine. With a silencer, too, all was not so simple. I’ll tell you: to put it from the sidecar, and “IZH-56”, but the effect was very small. It came even before, that made the end of the exhaust pipe and burned a small hole, sending gases into the earth — so the exhausts of the engine became even fainter. Most any muffler from a motorcycle “IZH-Jupiter”. But it needs to be improved to increase the holes in the elements. Two-cylinder engine mounted on a three-wheeled all-terrain vehicle on the tires. The Rover mounted on the frame of the motorcycle “IZH-Jupiter”. Ran in the engine on cold, the trailer vehicle to the tractor T-150. So I dragged an hour and a half. The fuel mixture made a very “fat” (the ratio of diesel oil is 2:1), candle twisted, and the cylinders threw the bag to water, oil and all. After that, replace the mixture to normal fuel ratio (gasoline—oil is 20:1) and decided to start the engine by kickstarter. Thought it would be hard to do, but no labour was required, it seemed that there was no compression. Then I realized: when one cylinder compression, the other in the time — on extension. In “reverse,” as is often the case with single-cylinder engines, the kick-starter was not beaten, motor was running smoothly. For vehicles with two-cylinder engine had to adjust by turning the grip throttle very carefully. Otherwise, the rear drive wheels to slip or the front up on its hind legs. But, as they say, a trick. 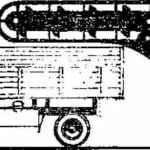 For many years the machine has become indispensable in economic Affairs in spring and autumn to hang a plow and plowed the land, planted and dug potatoes, summer trailer truck and carried hay and other goods, winter sleds dragged or brought from the forest with wood or whips. Now, when I purchased the tractor, the motor decided to move. Eleven years of heavy use (very often had him “squeeze” the maximum possible) still made themselves felt.